I was familiar with many of these folks from prior reading and events. Sam writes powerfully about trans and non-binary identities and mental health in Everyday Feminism and Let’s Queer Things Up. 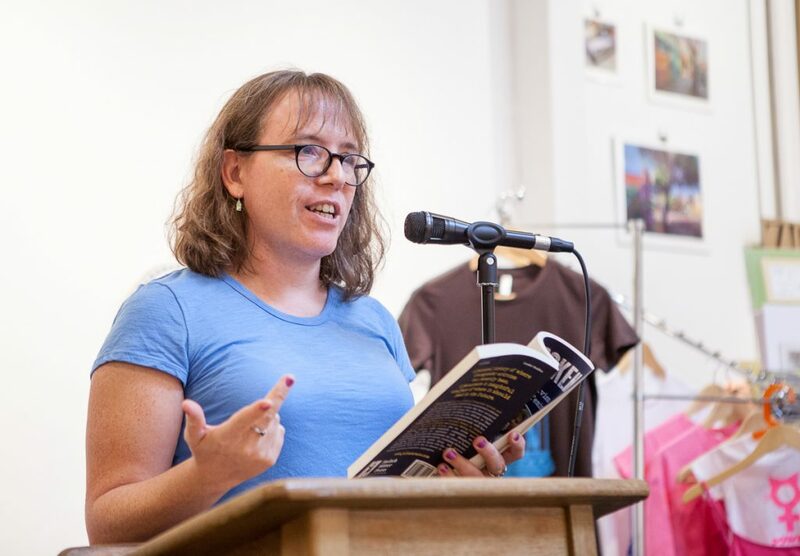 I’d already met Julia, who I’ve mentioned on this blog frequently, at one of her book launch events. 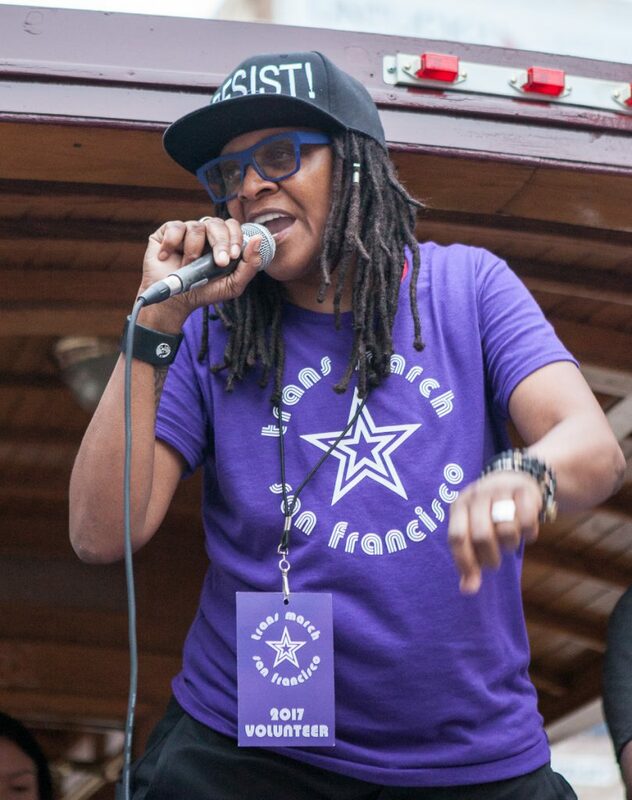 I’d seen Akira emcee’ing the Trans Day of Remembrance and Compton’s Cafeteria Riot 50th anniversary, and performing (as Tajah J) at the Trans March. 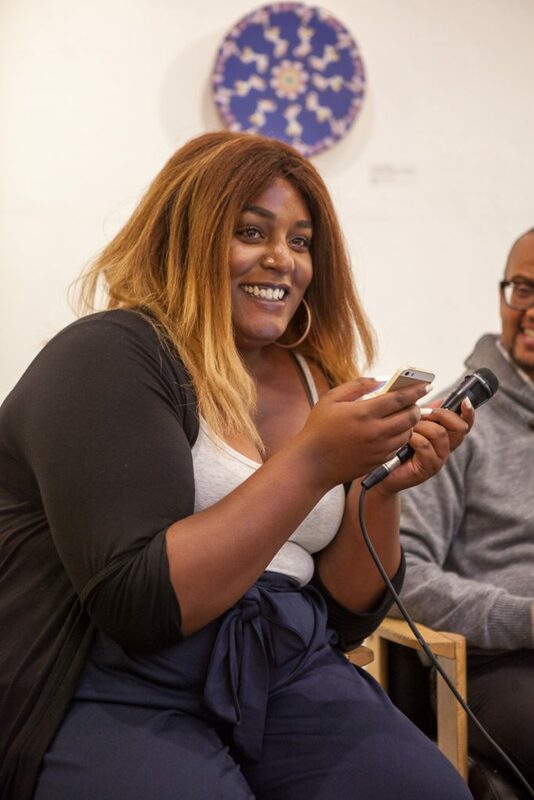 I recognized Ar’ia from the Black Excellence Tour (and I believe the Trans Day of Visibility as well). [Image: Aria Sa’id reads from her phone. I had good conversations with several of the speakers. One of the organizers suggested I might speak at a future event myself. I don’t consider myself a writer in the literary sense, nor an artist; I’m a blogger, basically, and my photography is photojournalistic in style. 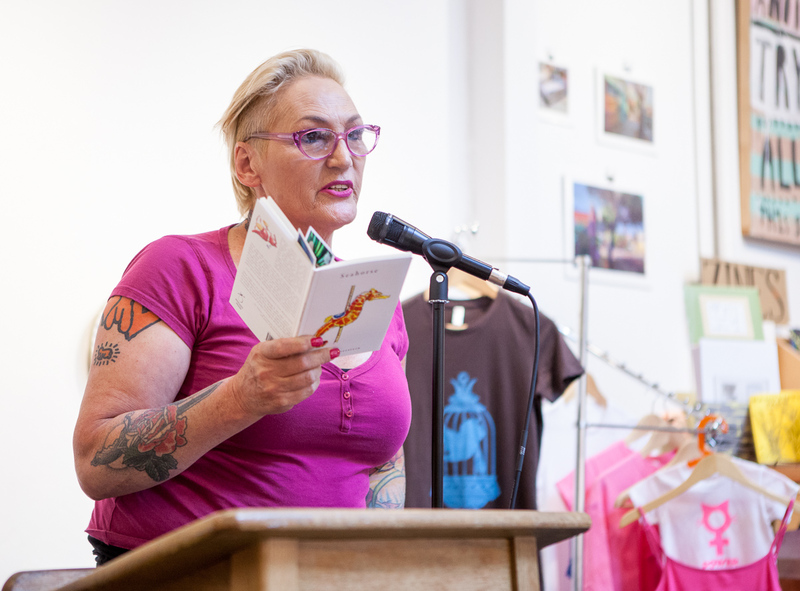 But I am getting more comfortable with public speaking, particularly about trans issues, so it’s something to consider. 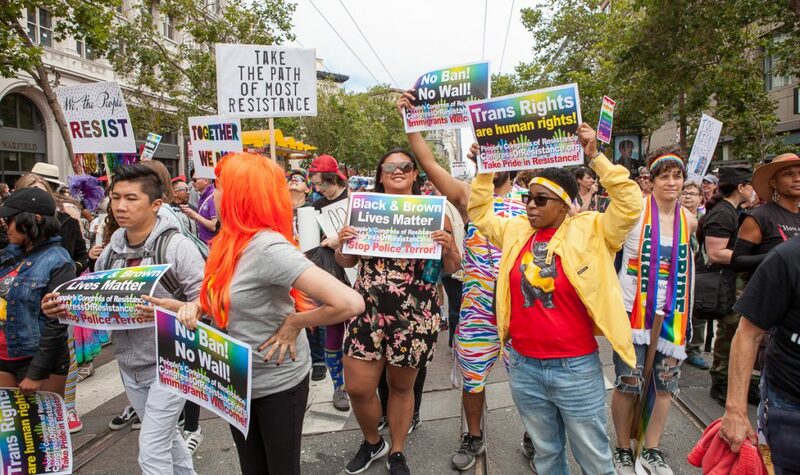 On Friday I attended the San Francisco Trans March for the fourth consecutive year. 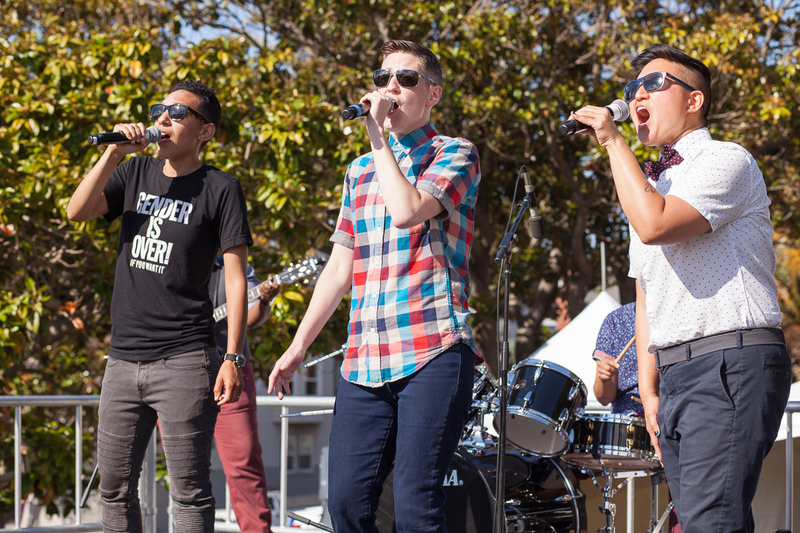 As usual, I concentrated on photographing the stage performances at Dolores Park rather than the audience or the march itself. 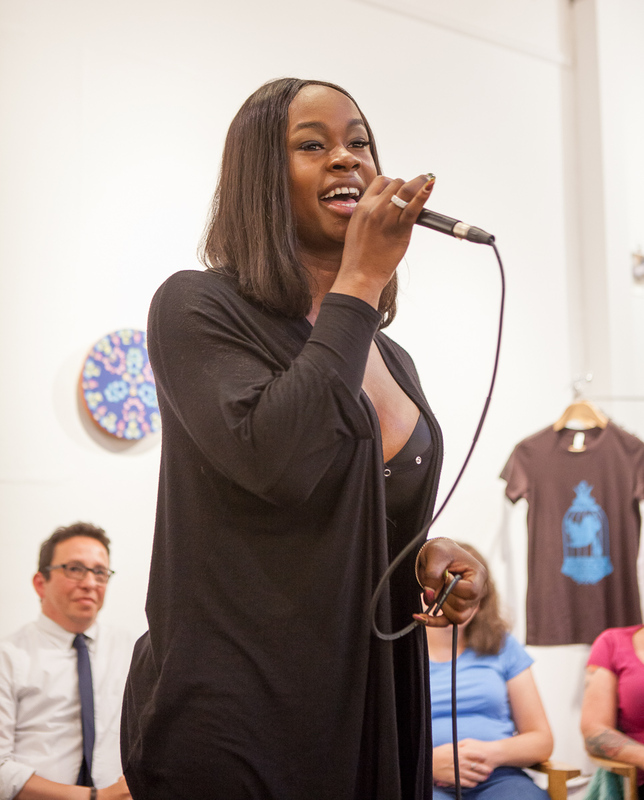 An assortment of singers, dancers, and speakers were featured. The highlight of the show for me was singer-songwriter Mya Byrne, who I’d enjoyed watching twice previously. 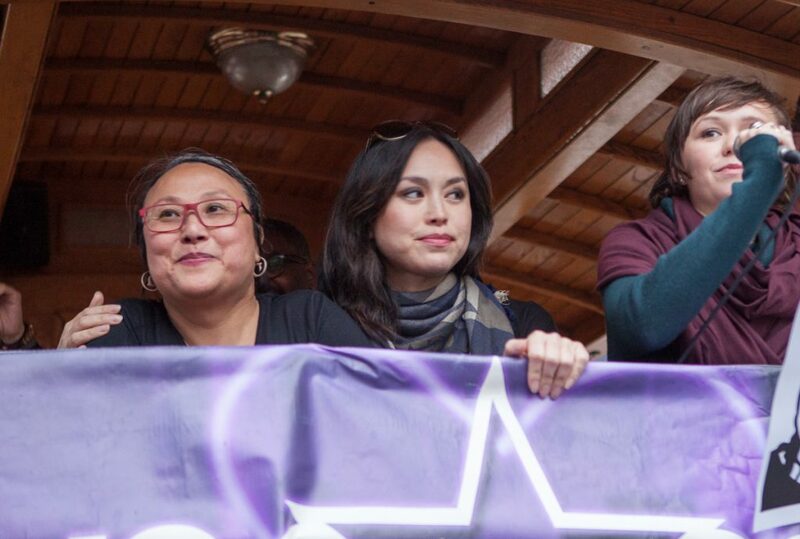 Other speakers included Alex U. Inn, activist, drag king, and community grand marshal of Sunday’s Pride Parade; professor and gender theorist Susan Stryker; and two actors from the miniseries When We Rise, who were introduced by activist Cecilia Chung, one of the trans people portrayed in that series. 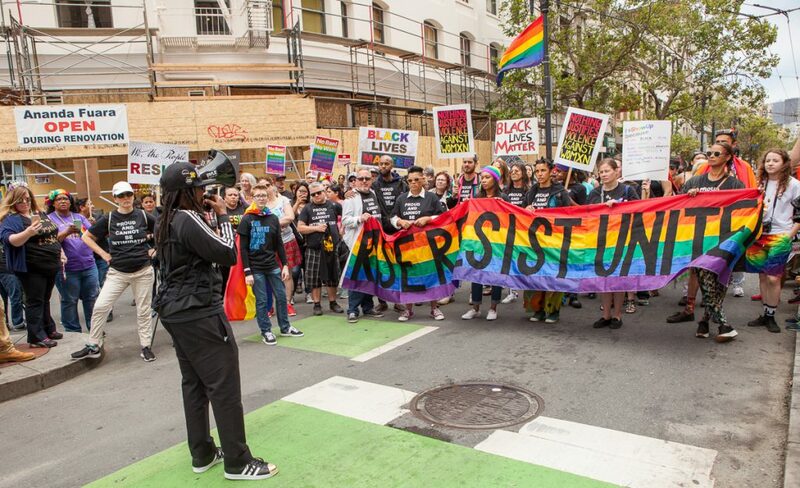 I had not planned to attend the main Pride Parade on Sunday, but when I read that Alex U. Inn was leading a Resistance contingent, I decided to join in. 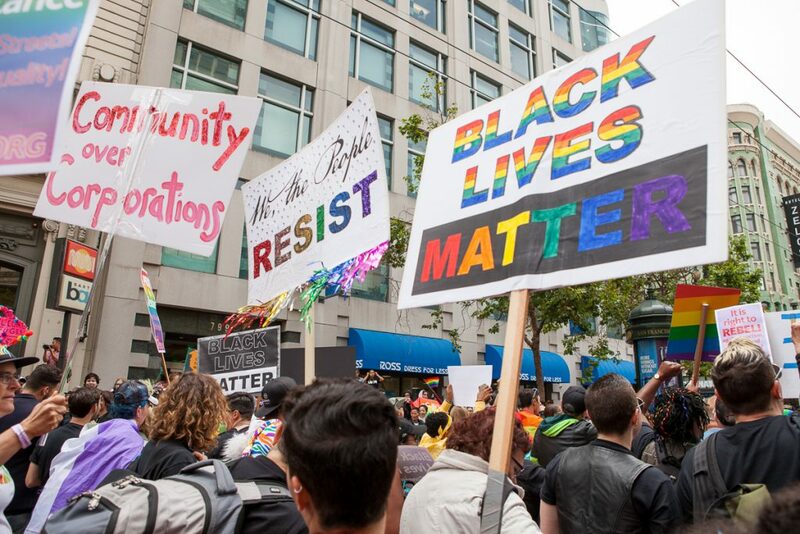 We had a good turnout from a number of different organizations, as well as people not affiliated with any particular group (like myself) who were more interested in protesting oppression than supporting the corporate pinkwashed version of Pride. At the end of the parade, our contingent was blocked and diverted from entering the celebration area at Civic Center. 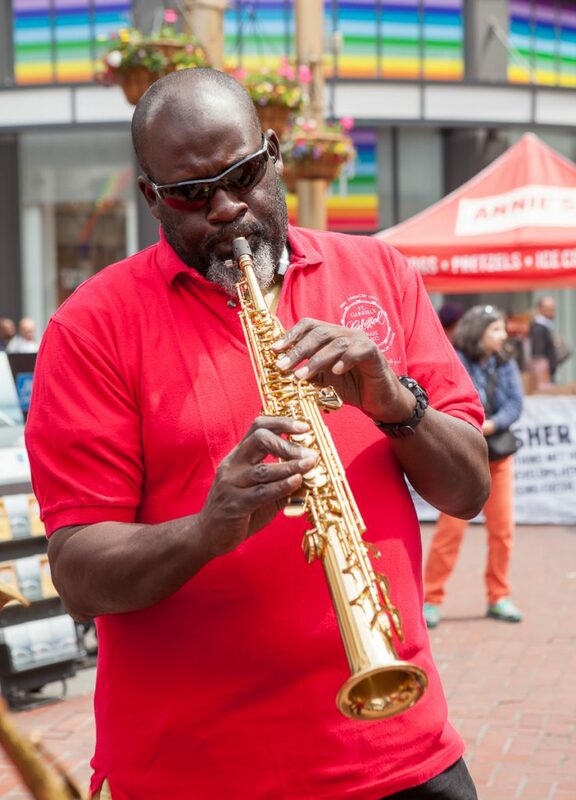 Alex was livid, denouncing the Pride committee for betraying and kettling us in this fashion. They said that we should go back in and demand to be heard. I was too tired to stick around long enough to see if any further action took place. But I did hear that one group in our contingent, the Degenderettes, had earlier stopped the parade for a short period of time, lying on the ground covered with (fake) blood, forcing every marcher thereafter (we were near the beginning of the parade) to walk over the body outlines of trans people. 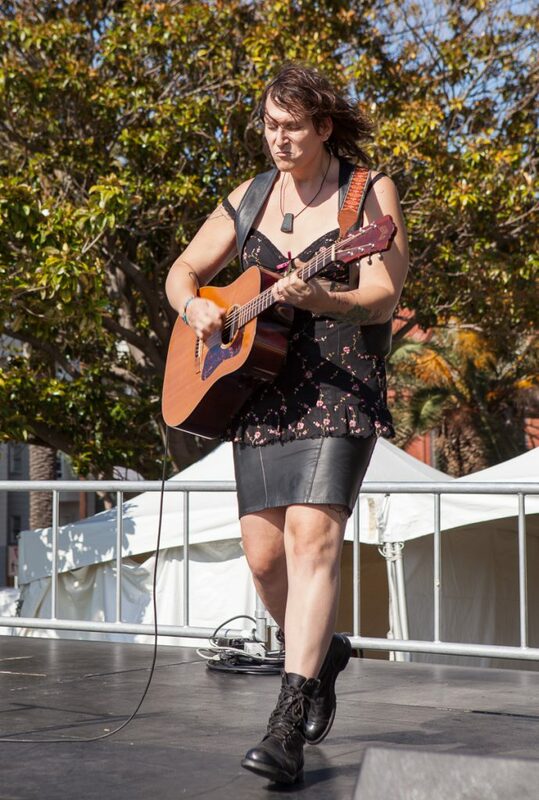 A powerful performance, which Mya Byrne also participated in (while holding a “Trans Dykes are Good and Pure” sign). My full sets of photos from the Trans March and the Pride Parade are available on Flickr. Some are also on Wikimedia Commons, alongside photos from other contributors. Please credit me as Pax Ahimsa Gethen if you use any of my photos, thanks! 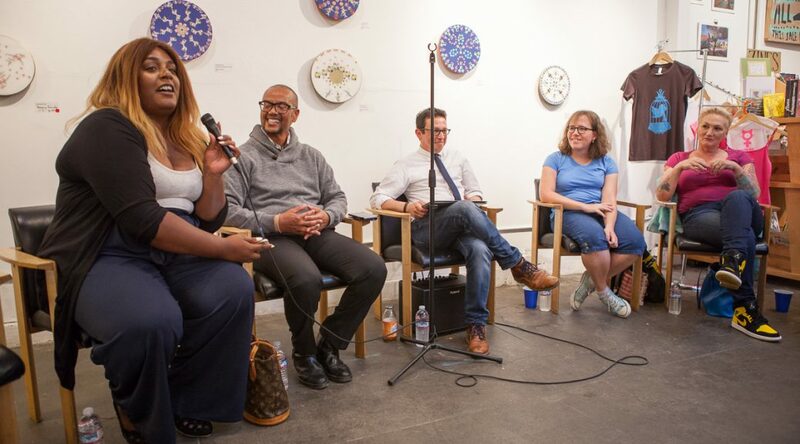 This coming Tuesday, June 27 at 1:30 p.m. (PDT), I will be presenting the inaugural talk for the LGBTQ+ Speaker Series hosted by the Wikimedia Foundation QueERG, an employee resource group for members of the LGBTQ+ community and allies. The talk will be livestreamed on YouTube and archived for later viewing. Discussion will be available in the #wikimedia-office channel on IRC. The title of my talk is Living Persons, subtitle Trans lives and Wikipedia: Representation and impact. This title is a reference to the English Wikipedia’s Biographies of Living Persons policy, as well as to the living trans and non-binary people who are affected, as readers and editors, by how trans folks are represented and discussed on the encyclopedia. 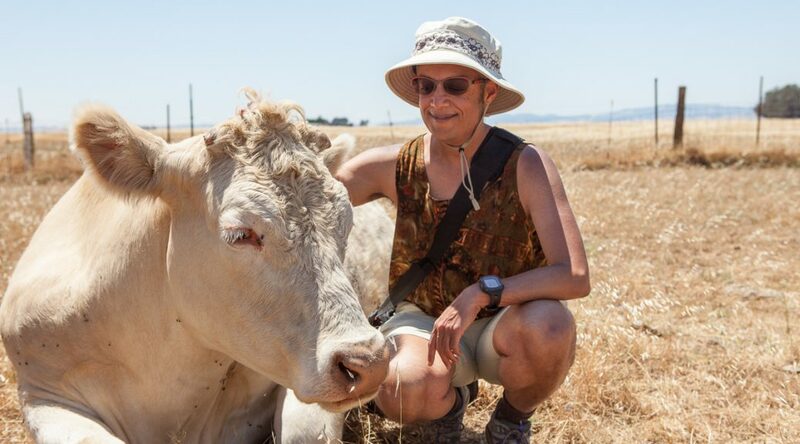 I’ve discussed these subjects in previous talks at the Bay Area WikiSalon and at WikiConference North America. 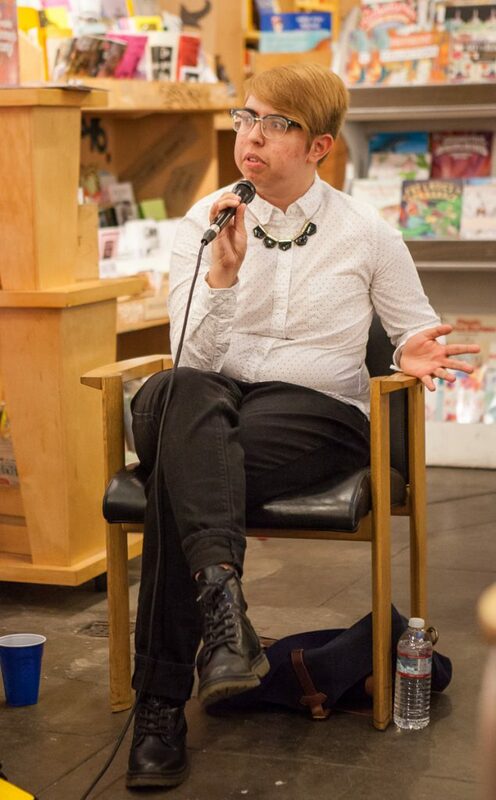 I plan to provide more current examples of trans issues on Wikipedia and in society, and talk about my own gender history and experiences as well. Editing Wikipedia articles and contributing photos to Wikimedia Commons has given me a sense of pride and purpose. This is especially valuable during Pride Month. I’ve contributed several new articles and a number of photos to the annual Wiki Loves Pride campaign, and plan to submit more before the month is out. Today I’ll be attending the Trans March for the fourth year in a row, so I hope to get good photos of the stage performances and speakers. I look forward to continuing to boost the visibility of my fellow trans and non-binary folks. 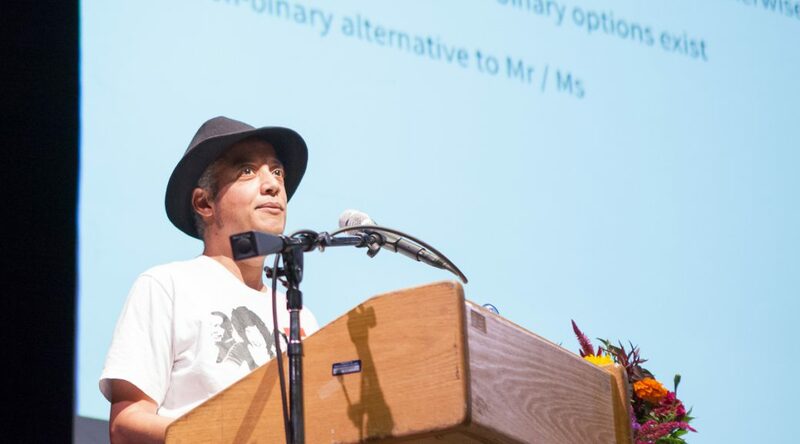 ETA June 27: The video, slides, and PDF of my talk are all now available online. 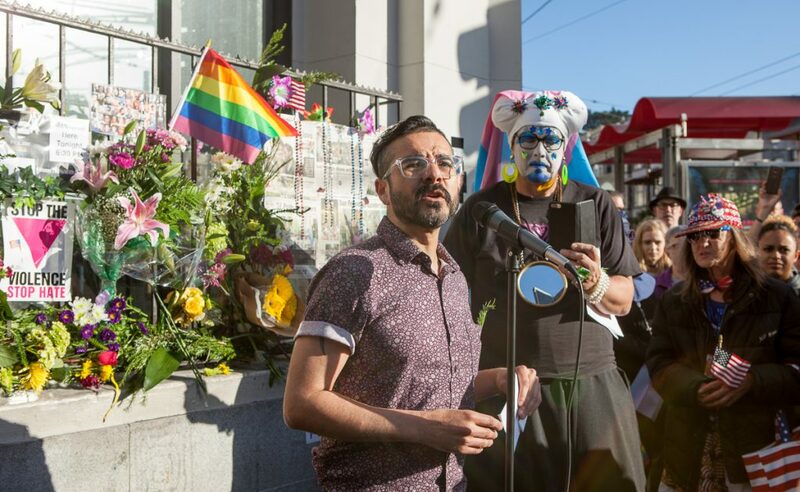 On Monday I attended a gathering in the Castro to honor the victims of the Pulse nightclub massacre, which occurred one year ago in Orlando. 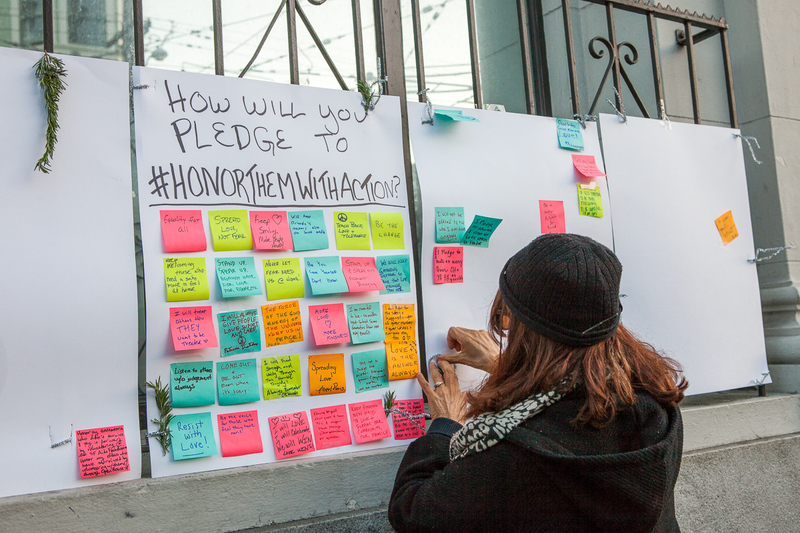 This San Francisco event was part of a nationwide “HonorThemWithAction” campaign. 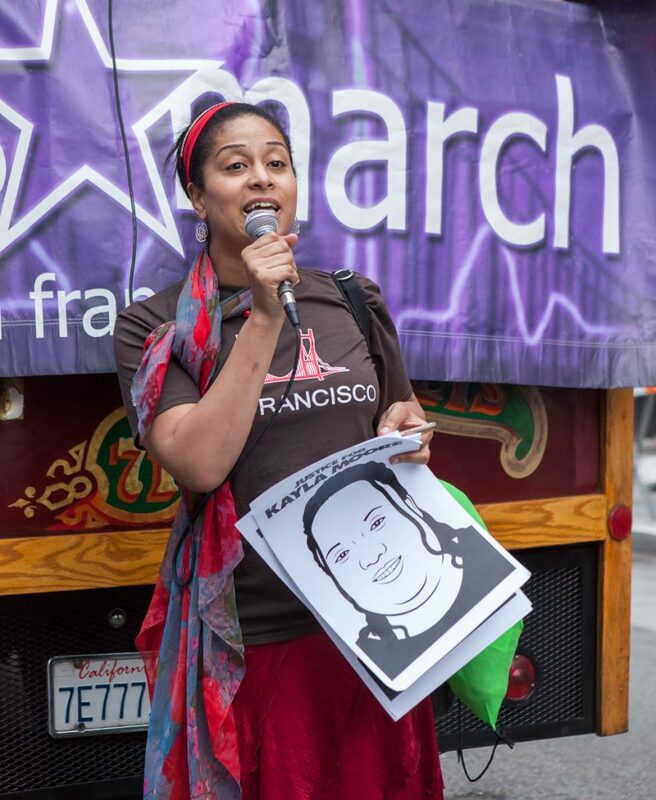 It was organized by Day of Decision San Francisco, a group that has organized a number of rallies related to marriage equality and other LGBT+ issues, so I recognized a number of people there. 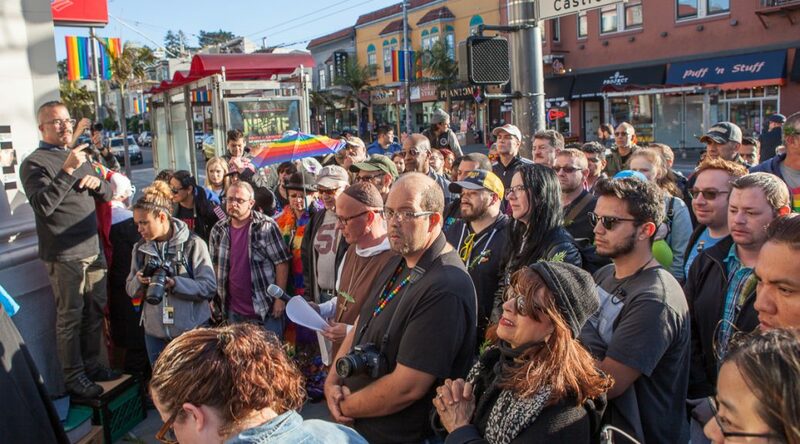 Unlike last year’s vigil on the night of the shooting, the street was not closed, so we crowded on the sidewalk at the corner of 18th and Castro. I was concerned that it would be a white-dominated event, but then Ruben Martinez gave opening remarks in Spanish and English. (ASL interpretation was also provided). 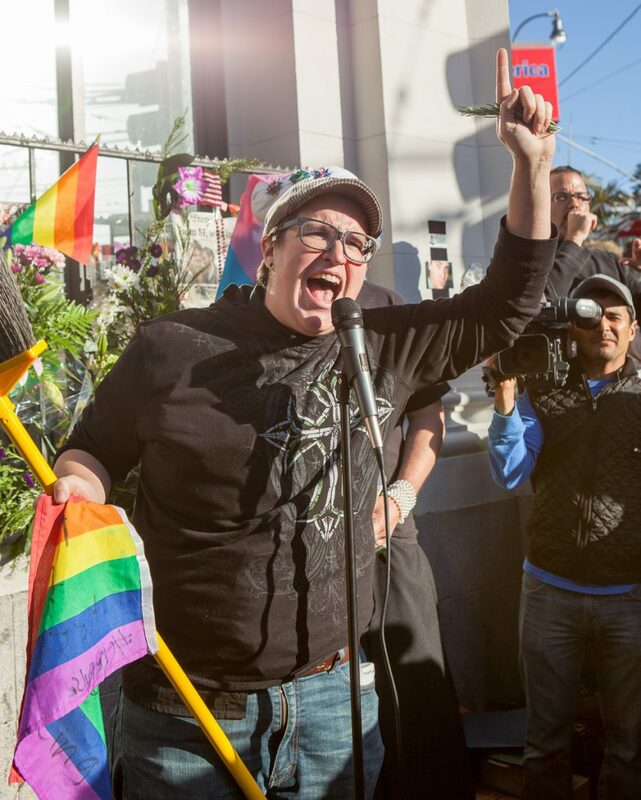 Pastor Megan Rohrer then gave a blessing and other remarks, which included shouting into the microphone, “Out of the bars and into the streets!” I recognized Megan from marriage equality events, but didn’t realize that they are also openly transgender and non-binary. Their inclusive ministry is one example of why I am willing to work with (some) religious officials and organizations, despite being a long-time atheist. 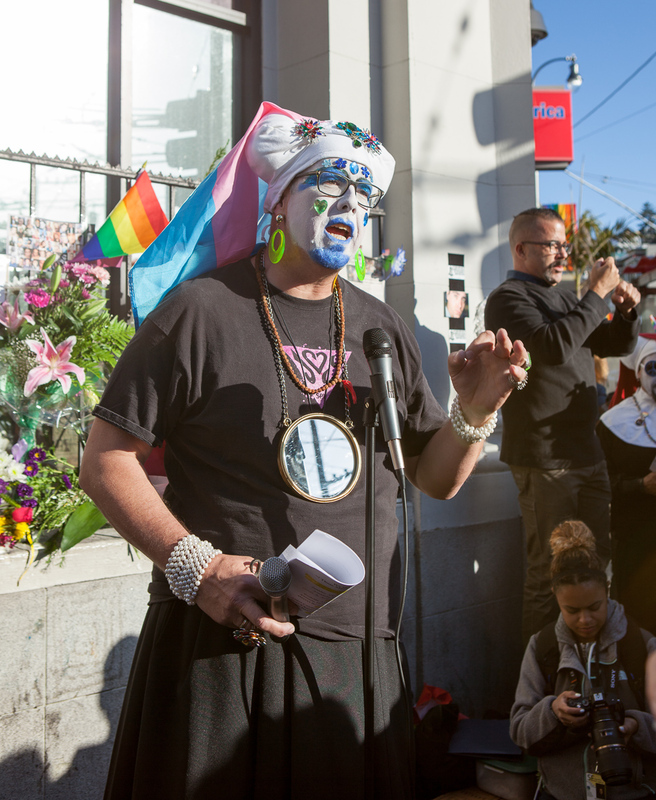 Sister Merry Peter of the Sisters for Perpetual Indulgence then led a reading of the names of the 49 killed at Pulse, also putting in a mention for victims of the Ghost Ship fire in Oakland, and for the many transgender people (overwhelmingly women of color) murdered this year. As a microphone was passed around, I read out three of the names myself, calling on my limited knowledge of Spanish to pronounce the names correctly (as most of the victims were Latinx). Hey y’all, I’m Pax, it stands for peace (*flashes peace sign*). I’m usually behind the camera, so I think this is the first time I’ve taken the mic at one of these things. I wanted to give a shout-out to all my fellow transgender and non-binary people. I’m actually agender, but I’ve transitioned from female to male for legal purposes, because non-binary gender identities are not seen as legitimate by 99.44% of the human population. I hope to change that. Your genders are legitimate. Your names are legitimate. Your pronouns are legitimate. Your choice of which restroom to use is legitimate. Don’t let anyone tell you otherwise. Don’t allow yourself to be erased. Thank you. A few more people spoke, including San Francisco Supervisor Jeff Sheehy (who I believe was not an invited speaker, just another attendee). Then Sister Merry took the mic again, and sprinkled the crowd with “fairy dust” (ashes from burnt offerings). Extra dust was provided in little bags for people to take with them. A whiteboard was provided for people to post notes of how they would take action to honor the victims. 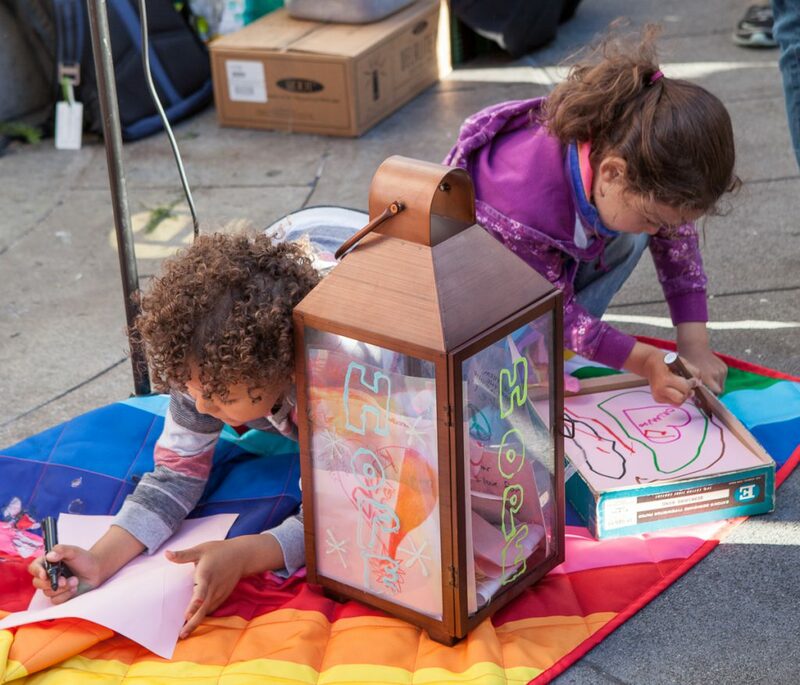 I wrote on my note, “Honoring authentic identities with words and pictures,” which is what I’m doing with this blog post. 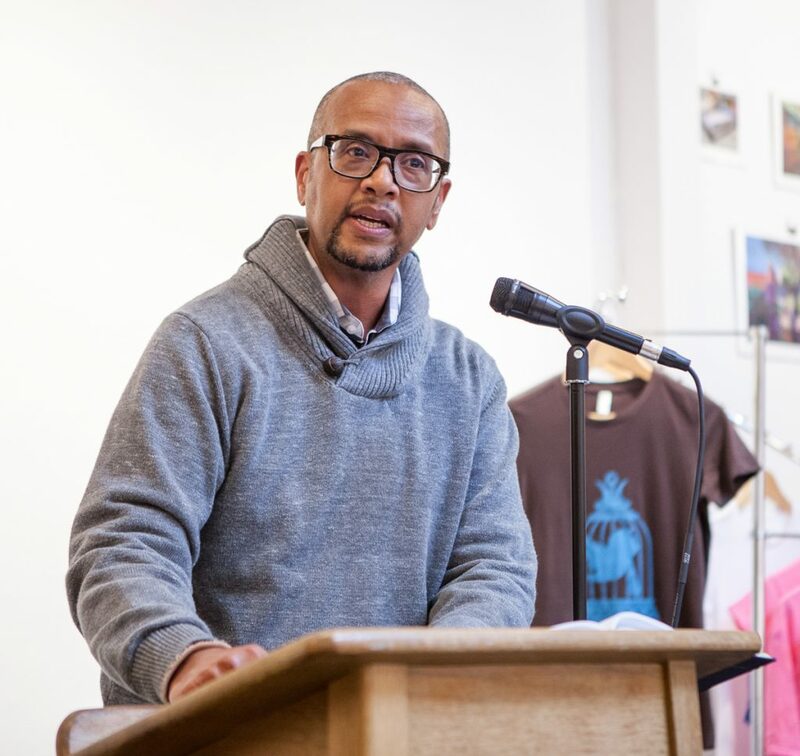 A couple of people also thanked me for my words after the event, so I was glad I spoke out. My full set of photos from the event is available on Flickr. Some of my photos are also on Wikimedia Commons (alongside photos from other contributors). Please credit me as Pax Ahimsa Gethen if you use any of my photos, thanks. 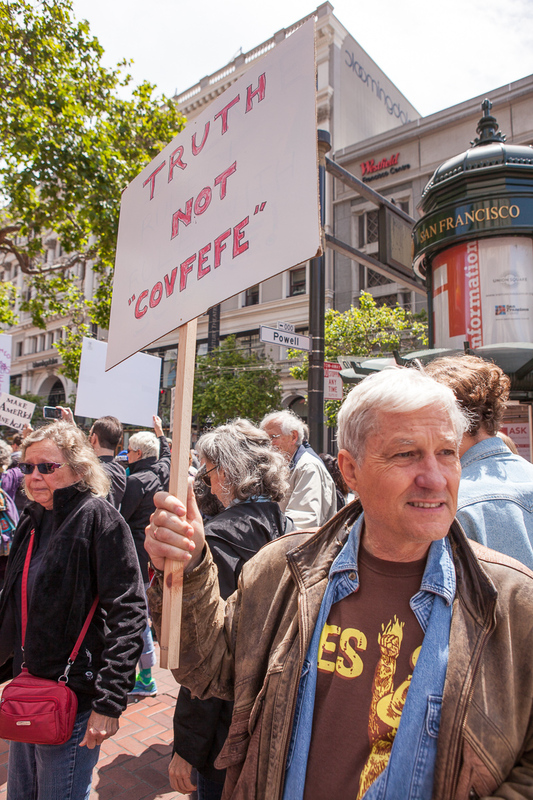 On Saturday I attended yet another anti-Trump rally in San Francisco, organized by Indivisible SF as part of the nationwide March for Truth. 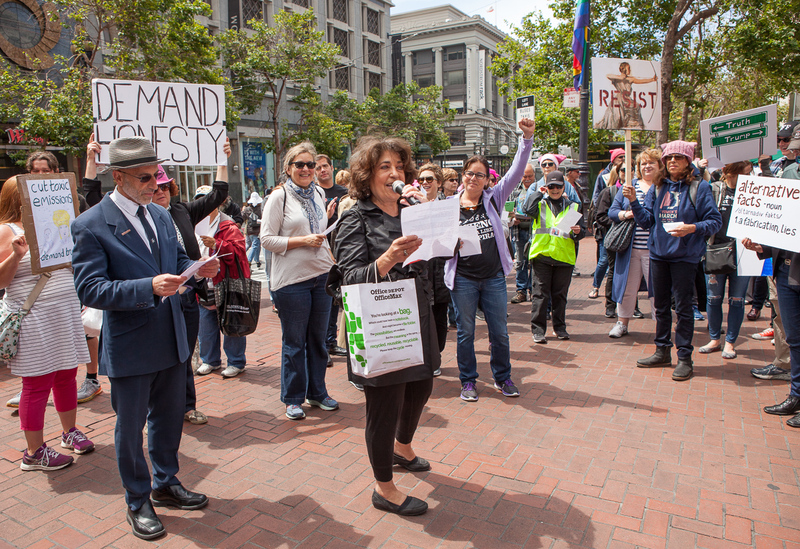 While rebranded as a “flashmob” since the organizers weren’t able to get a permit to march on the street, we did have a “sidewalk procession” from the Powell Street cable car turnaround to Justin Herman Plaza. 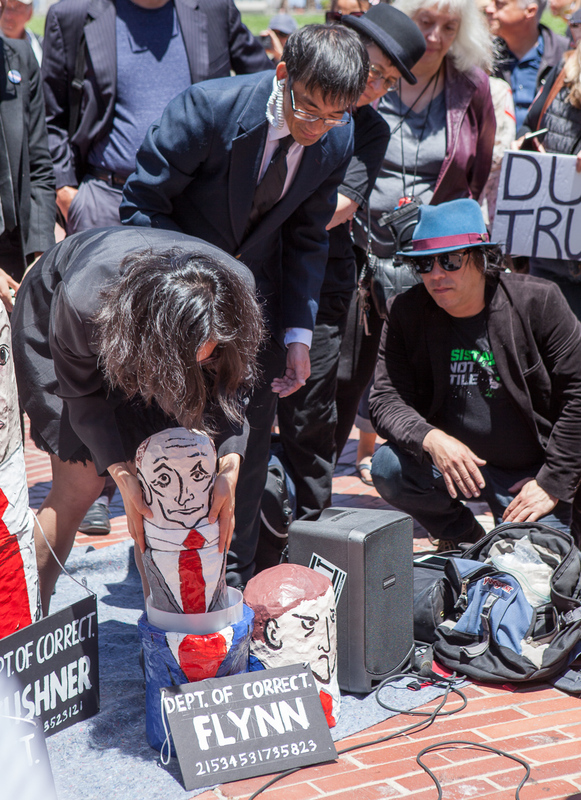 The original purpose of the March for Truth was to protest the lack of transparency regarding alleged Russian interference in the presidential election and Trump’s tax returns. But Trump’s recent stated intention to withdraw from the Paris Agreement was also criticized. A few signs also referenced the silly “Covfefe” tweet. Organizers led the crowd in a singalong of John Lennon’s “Gimme Some Truth” (played through a woefully inadequate speaker, but they did pass the bucket for donations to get better equipment). This was repeated midway through the march as well as at the end. St. Gabriel’s Celestial Brass Band provided excellent music for the event. 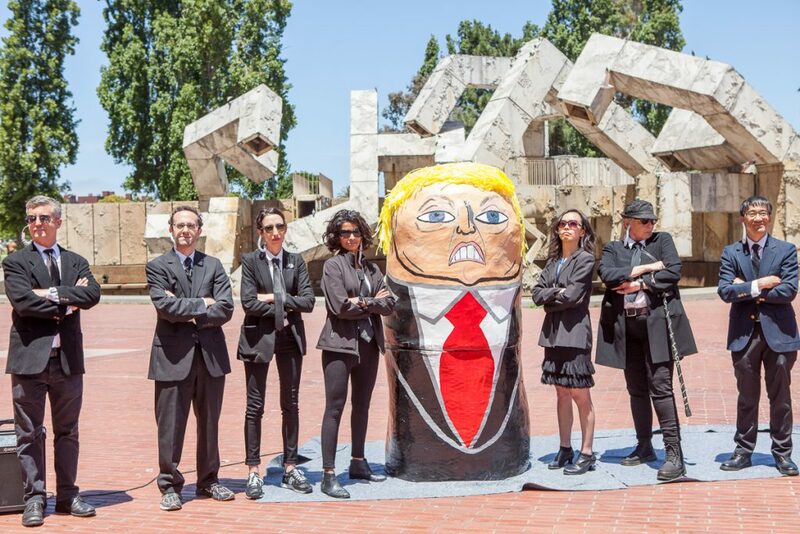 Upon reaching Justin Herman Plaza, organizers dressed like FBI agents unveiled a set of Russian dolls, representing Trump, Mike Pence, Jared Kushner, Carter Page, Michael Flynn, and Vladimir Putin. Each was given a “Department of Corrections” name and number, in hopes of their impending arrest. As I posted on Facebook today, I’m not a fan of the prison-industrial complex. But if Trump is ultimately found guilty of high crimes, I think a suitable punishment for him would be house arrest and revocation of all Internet access. 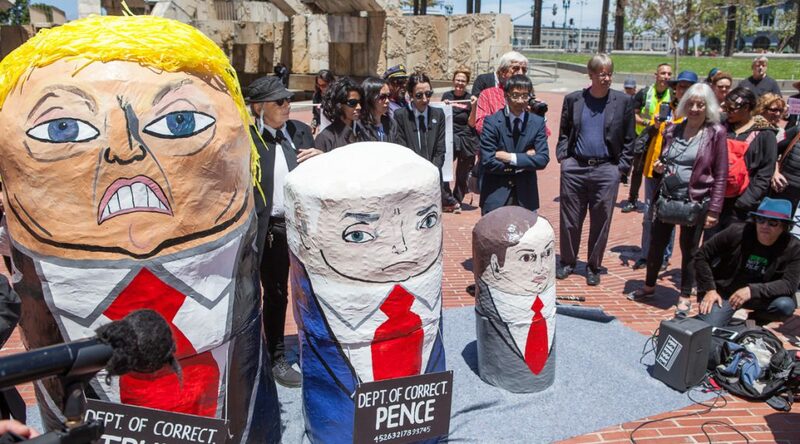 While I enjoyed the creativity of the costumes and Russian dolls, I couldn’t help feeling depressed during the march itself. I’ve lost count of the number of these protests I’ve attended, and I’m honestly not sure they’re making any real difference. After all, we’re in an era where a politician can flat-out assault a reporter, with multiple witnesses, and still be elected to Congress the next day (yes, I know there were absentee ballots involved, but that doesn’t account for all of the votes). And meanwhile the bigot-in-chief merrily tweets away, using the tragic death of others to appease his base and advance his own agenda. My photos from the event are available on Flickr. Most are also on Wikimedia Commons (alongside photos from other contributors). Please credit me as Pax Ahimsa Gethen if you use any of my photos, thanks!